Quality:Food Grade Silicone; Heath Safe Material and Reusable. Easy to use:Nonstick coating for easy release and clean-up. Kitchen tool:You can make cute madeline cake at home for dessert or party. Design:Special Madeleine Shape perfect for beauty french madeleine cake. Unique Styles:The elegant Shell shape is different from normal madeleine cake. [SIZE]Food Grade Silicone; Heath Safe Material and Reusable.29*17.5CM/11.4"*6.9". [WASHABLE]You can use the Baking Pan whenever you want to make delicious mini cake. [KITCHEN DIY]You can make cute madeline cake at home for dessert or party. [DESIGN]Special Madeleine Shape perfect for beauty french madeleine cake. 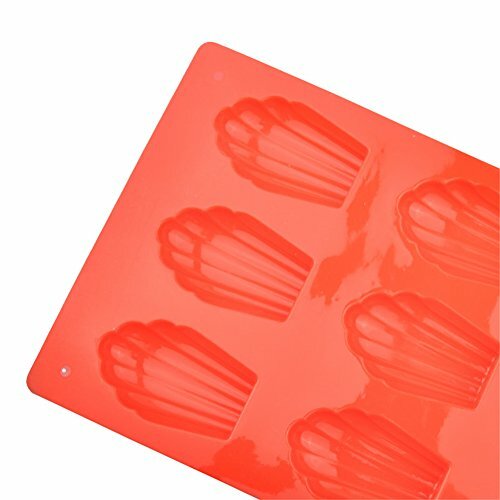 [NON-STICK]Easy to use mould very easy release and clean-up, and easy to clean. Create your own special desserts.The Default Delivery Time is about 7-15 Business Days, Usually Get the Item in about 7-10 days.